It is but natural that people pick the best players from their generations as the sport’s best ever no matter what sport. For many octogenarians, Sydney Barnes was the greatest bowler to play the game of cricket as would many middle-aged men swear by Malcom Marshall. The spread is similar in all sport. Here, I take a look at one of tennis’s all time greats, Jack Kramer, who, as a player and as an administrator. Born to a railroad man in Las Vegas in 1921, Big Jake would go on to be a part of the golden generation of American tennis players who dominated world tennis: King, Marble, Riggs, Schroeder, Wills, Budge, Vines. Young Kramer played an aggressive game with a huge serve, which he generally followed-up with a winning volley much like the way Pete Sampras played. 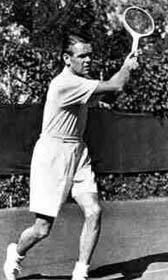 His aggressive serve-and-volley game earned him a doubles spot in the U.S. Davis Cup team in 1939. Almost immediately after that Kramer went away to serve as a Coast Guard officer during the Second World War. He lost some of his best years serving as the Coast Guard officer at the pacific. After returning from the war he had a great run at Wimbledon in 1946 only to lose in the semifinals as he suffering from blisters in his feet. He went on to win the U.S. Nationals, forerunner of today’s U.S. Open, the same year. He followed it-up with a victory at Wimbledon in 1947, where he swept past the challenge of Tom Brown 6-1, 6-3, 6-2 in a mere 45 minutes. He went on to defend his U.S. Nationals title in a classic five-setter; coming from two sets down to beat Frankie Parker. That finals holds significance, as it was just before the final that Kramer decided he would turn professional. Also, those were the times of “shamateurism,” when players remained amateurs in order to compete in major tournaments, but took money under the table. Between 1946 and 1953 he was considered to be the no.1 player in the world. At the peak of his powers as a player, he was asked to endorse a racquet from Wilson Sporting Goods. They named it Wilson Kramer. Kramer chucked his beloved Don Budge racquet for Wilson’s new one, but sent it back after going down to Bobby Riggs. He asked Wilson to repaint it, and Wilson obliged, as they wanted to have a racquet named after Kramer. Since 1947 Wilson has manufactured more than 30 million Jack Kramer Autographed Racquets, giving it the distinction of being the most popular racquet in the history of the game. Kramer was to get two-and-a-half percent of the racquet sales. Wilson eventually had to renegotiate the deal as the racquet sold by the millions. He started playing on the pro-tour playing in cities across the world. He had a great time against his rivals Bobby Riggs, Frank Sedgman and Pancho Gonzales. With little left for him to achieve, and suffering from an arthritic back, he retired in 1954. He was, by then, running the pro-tour that he had dominated so much. He took on the tennis establishments of Australia, England and other nations and sought identity for professional tennis. In those days, there were severe restrictions on the money that could be taken out of Australia, so Kramer took some of his earnings in racehorses. As “The Kramer circus” grew in stature over the years the pressure began to tell on the tennis federations, which finally led to the establishment of “Open tennis” in 1968. In 1972 he became the first executive director of the players union, Association of Tennis Professionals (ATP). Kramer also served as an announcer at Wimbledon for the BBC. BBC banned him in 1973 following a player boycott headed by Kramer. 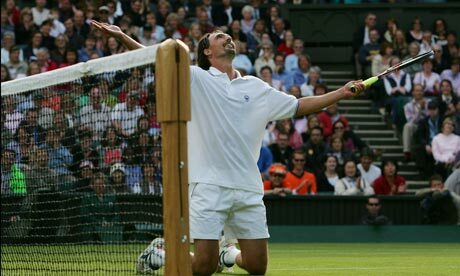 Niki Pilic, the Yugoslavian, refused to play in the Davis Cup and a suspension by the International Tennis Federation extended through Wimbledon. When Wimbledon honored Pilic’s suspension, Kramer led a player boycott that left Wimbledon bereft of top players. Kramer turned villain as a result. 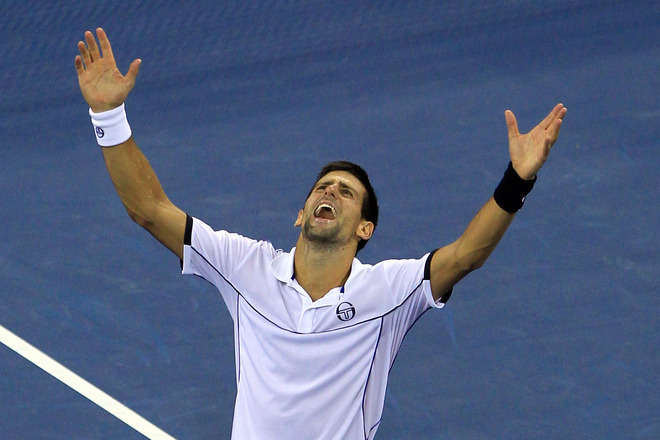 But, as it turned out, it led to players gaining more control of tennis. Kramer was a shrewd businessman. He once hired “Gorgeous Gussy” Moran to serve as a part of his warm-up matches for one of his tours. As you’d expect he hired her more for her beauty than for her game. His belief that women didn’t sell as well as the men eventually cost him in 1970, when Billie Jean-King led a walk-out after a tournament run by Kramer. That event, the Pacific Southwest Tennis Tournament, offered only 15 percent of the available prize money ($50,000) to the ladies. The walk-out led directly to Virginia Slims Tour and then to the creation of Women’s Tennis Association (WTA). The Pacific Southwest Tennis Tournament became the Jack Kramer Open in 1979, and was known by that name until 1983. His son Bob Kramer now runs the event at the UCLA Tennis Center. This year Jack Kramer saw his last tennis match from the sidelines of that UCLA Tennis Center, as he took in an exhibition match between Pete Sampras and Marat Safin. “He was a class act and always willing to help. I was happy to see him and say hi at the L.A. Tennis Open. This is truly a great loss for tennis,” said Sampras the day after Kramer passed away. “We all needed money and he helped a lot of players get some,” says Rod Laver who came into the game when Kramer was a monumental figure in tennis. Jack Kramer knew everyone in the game of tennis for over half a century. He was a great tennis player and an astute businessman, but it is for his contribution in the elimination of the line between professionals and amateurs that he will be best remembered.